SUDBURY, Ontario, Dec. 20, 2018 (GLOBE NEWSWIRE) -- Supreme Metals Corp. (the “Company” or “Supreme”) (CSE: ABJ) (FSE: A68) is pleased to announce the presence of a significant near surface magnetic anomaly on their Bloom Lake East Property discovered in a recent magnetometer survey. The arcuate 2.5km long magnetic anomaly is located 2.5 km from Champion Iron Mines’ Mill Site and 500m from an existing road. A stratabound Superior-type iron formation known as the Nip Lake West occurrence is found in this area. This occurrence has never been trenched or drilled. One grab sample collected from this site in 1979 gave 59.9% Sol. Fe. 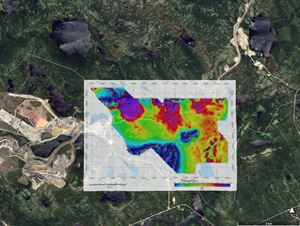 The Bloom Lake East Property is located near the Labrador, Newfoundland Quebec border between the Bloom Lake iron mine of Champion Iron Mines in Quebec and the Wabush iron Mines of Iron Ore Company of Canada (managed by Rio Tinto) in Labrador. When originally acquired, the property consisted of 3 separate blocks of 5 licences composed of 84 claims comprising 2,100 hectares. The property was initially acquired for its cobalt potential with the presence of numerous iron occurrences in the area also being recognized. Since review of this magnetic survey, Supreme has applied for an additional 4 licences consisting of 21 more claims over areas of potential magnetic anomaly extensions that included 2 additional known iron showings, namely the Sitting Bear #1 and the Sitting Bear #2 containing manganese as a secondary commodity.